This year marks the tenth anniversary of our move of Sankaty Light 405 feet to the northwest of the original site. The move was designed to preserve the Light for generations to come. We’ll be marking the anniversary this summer by a number of events including a special program on the Light at the annual ‘Sconset History Night at the Casino on August 14th. We are also planning our first annual Jog in the Fog for Saturday morning July 29 starting at Ruddick Commons and finishing at the Light. This will be a fun family run/walk for all.There will be shirts and prizes at the conclusion. Our annual Night Under the Light Gala July 16 will highlight the Light. There will be a special Vintage ‘Sconset silent auction section and an incredible working Lego model of the Light. Our full schedule of events for the Season is included so mark your calendars. It would be hard to imagine Sconset without the Light. Walks and bike rides to the Light are a family tradition for many of us. Sunsets at the Light are, as they say, priceless. And yet, as the Lady gracefully ages, she needs an increasing amount of maintenance. The annual maintenance for the Light is well covered by our annual membership contributions for which we thank you. It’s the larger periodic capital expenditures which are more of a challenge. These are hard to predict and of late seem to come with increasing frequency. In 2015 we spent approximately $150,000 to do some major repointing, sandblasting, painting and other work on the Light. Earlier, in 2013 we spent almost $60,000 in an attempt to correct a leakage issue in the housing of the Light. Our heavy maintenance is far from done and we continue to work to preserve the structure in what we all know is a difficult marine environment. Sankaty shines bright, but sitting atop the bluff she is very much exposed to continued blows out of the Northeast. Mindful of the growing maintenance needs of the Light, we thought it appropriate on this the 10th Anniversary of the moving of the Light that we try to establish a fund which, with other monies earmarked for the Light, would be sufficient to cover capital maintenance costs of the Light for the foreseeable future. We are fortunate, and quite grateful, to have an anonymous donor willing to make a $250,000 challenge grant. The donor will match all contributions on a dollar for dollar basis. We hope this generous challenge grant will enable us to raise at least $1,000,000. The monies we raise for this fund will be dedicated to capital maintenance projects for the Light as approved by the Board of the Trust from time to time. We would encourage all of our members and indeed all ‘Sconseters and Nantucketers alike to contribute to the fund. The fund will be called the Sankaty Light Capital Maintenance Fund. As is always the case, all gifts large and small are very much appreciated. Those contributing $10,000 or more will be specially recognized and by way of thanks will be included as 1984 Sponsors of this year’s annual Sconset Trust Gala without further contribution. As such these donors will be entitled to 4 tickets to the Gala. Those contributing $1850 or more will likewise be specially recognized at this year’s Gala. 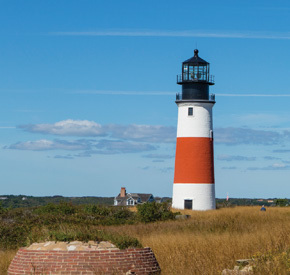 Please do consider making a contribution to the Maintenance Fund to help mark the 10th Anniversary of the historic moving of the Light, and with your help the Sankaty beacon will continue to shine bright atop the Sconset bluff. With thanks in advance for your consideration and help.